For a time between 1961 and 1964 the RIVER QUEEN (formerly the CAPE GIRARDEAU/GORDON C. GREENE) and the Str. 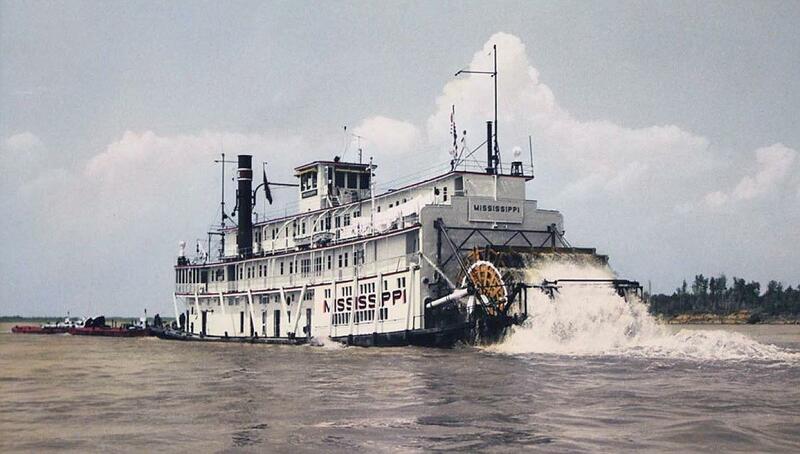 MISSISSIPPI (the 3rd Corps of Engineers boat by that name that began her career on the river in 1926 and was decommissioned in 1961) were moored side by side just north of the "old" Mark Twain Memorial Bridge on the Illinois shore opposite Hannibal, Missouri. 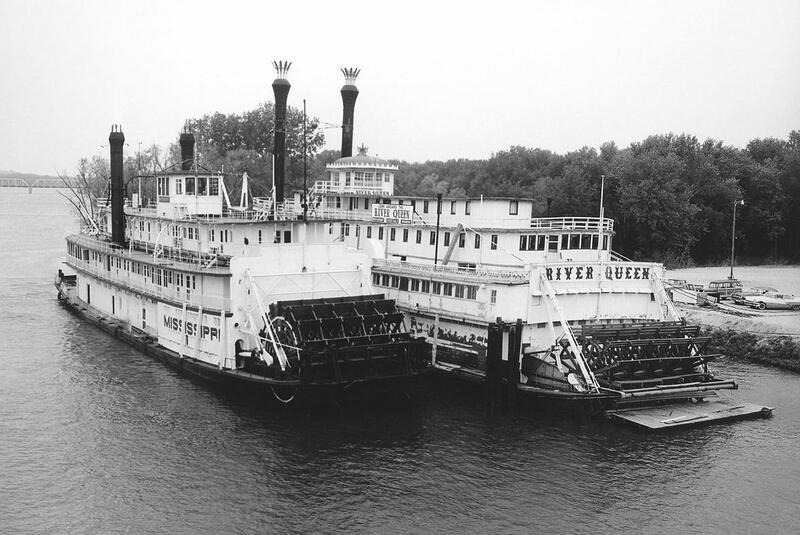 This photograph dates from the time when the 2 veteran boats kept each other company until the RIVER QUEEN was taken down river to St. Louis in July, 1964. In 1966 the MISSISSIPPI was also sent to St. Louis and had her name changed to BECKY THATCHER after a boat by that name that sank in 1965. 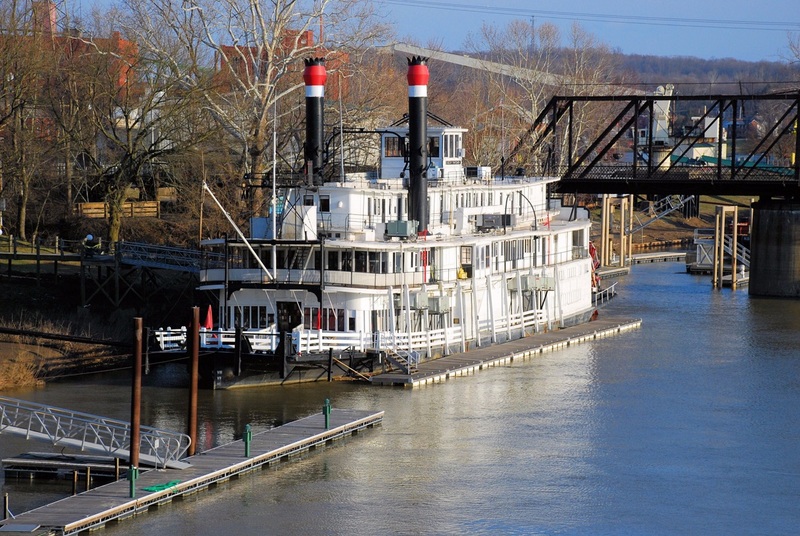 In 1975 the former MISSISSIPPI, now called the BECKY THATCHER was moved to Marietta, Ohio on the Muskingum River and began a theatrical career with the Ohio Showboat Drama group of Marietta. In October 2009 the BECKY THATCHER was towed to Neville Island above Pittsburgh, where she sank, a total loss in February 2010. This photo was from the Hannibal Courier Post's archive of negatives which are now in the Hannibal Public Library's Missouri Room. 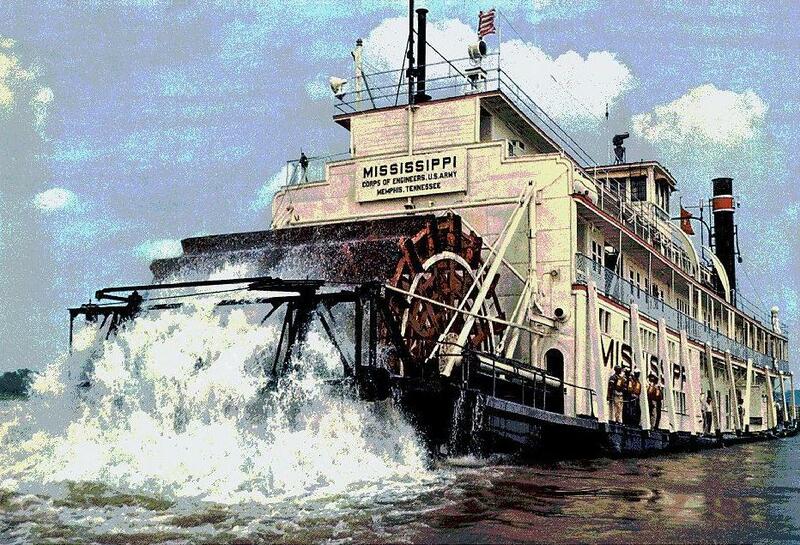 Keith Norrington's post about the MISSISSIPPI on steamboats.org, April 2006 was a great resource for composing this caption. Scanned from color slide of the MISSISSIPPI at Memphis, 1954. 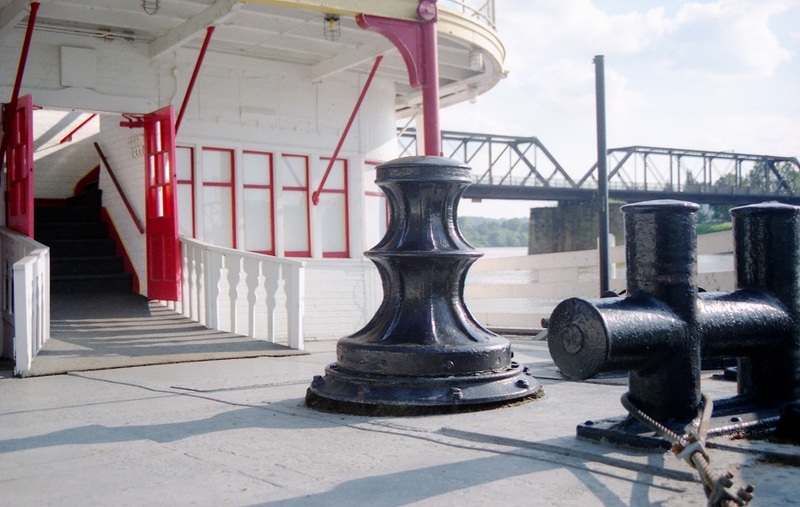 This is the main deck of the Becky Thatcher at Marietta, Sept. '90 with the open doors to the stairway to the boiler deck on the left, the capstan at center and the "bitts" far right. Double page photo from a pictorial history of America's technology & craftsmanship and the artistry that went into them: America's Arts and Skills by the Editors of LIFE magazine, 1957. Igor Edelman mounted the double page on linen for me and airbrushed the folded seam at center; then I had the piece matted and framed. The content was probably serialized in issues of LIFE magazine first; then assembled into a book with editorial enhancements and additional pictorial content. 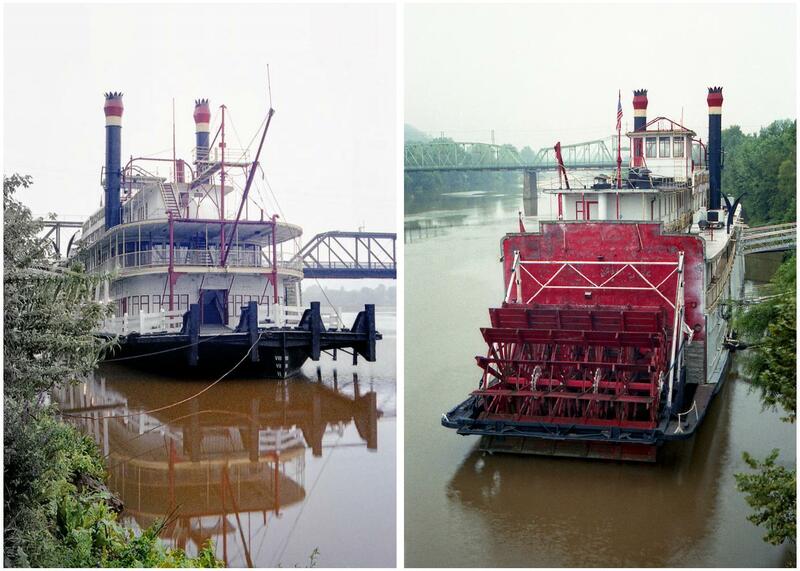 This steamboat is the same MISSISSIPPI which was built in 1926 for the Corps of Engineers that bore the name "BECKY THATCHER" when she sank in a channel off of Neville Island in the Ohio River in February of 2010 after being towed there from Marietta where she had served as a Showboat and later a restaurant and bar on the Muskingum River since 1975. It's nice to see the MISSISSIPPI in full portside profile when she was in good shape and still in service prior to being sold in 1961. 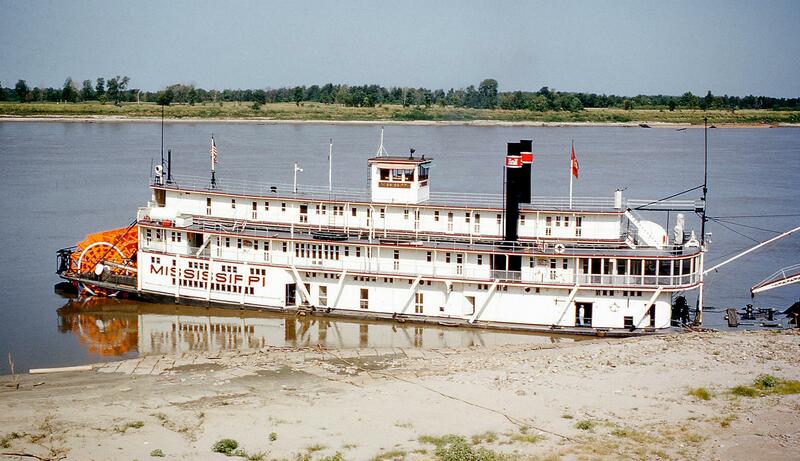 For a while she was at Hannibal, MO next to the "RIVER QUEEN" (which first known as the CAPE GIRARDEAU and later as the GORDON C. GREENE). 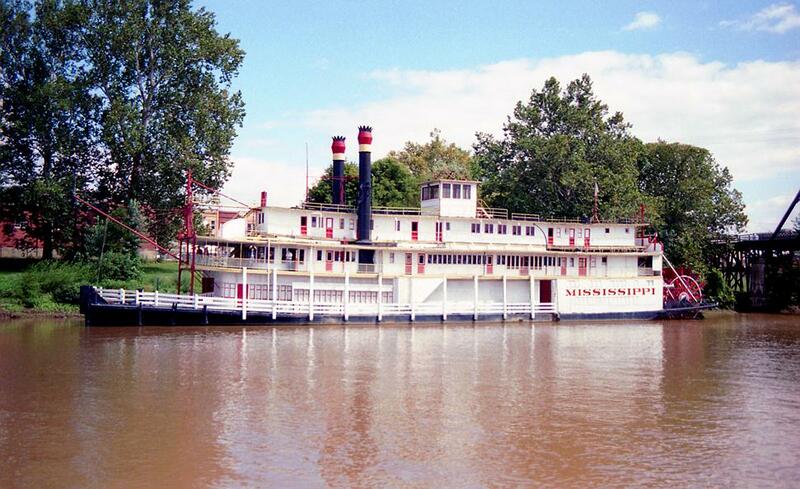 The MISSISSIPPI was renamed "BECKY THATCHER" while she was at St. Louis and Ruth Ferris created a steamboat museum on board which Keith Norrington has many fond memories of visiting as a youngster. One of my favorite photos of the MISSISSIPPI before it became the BECKY THATCHER. 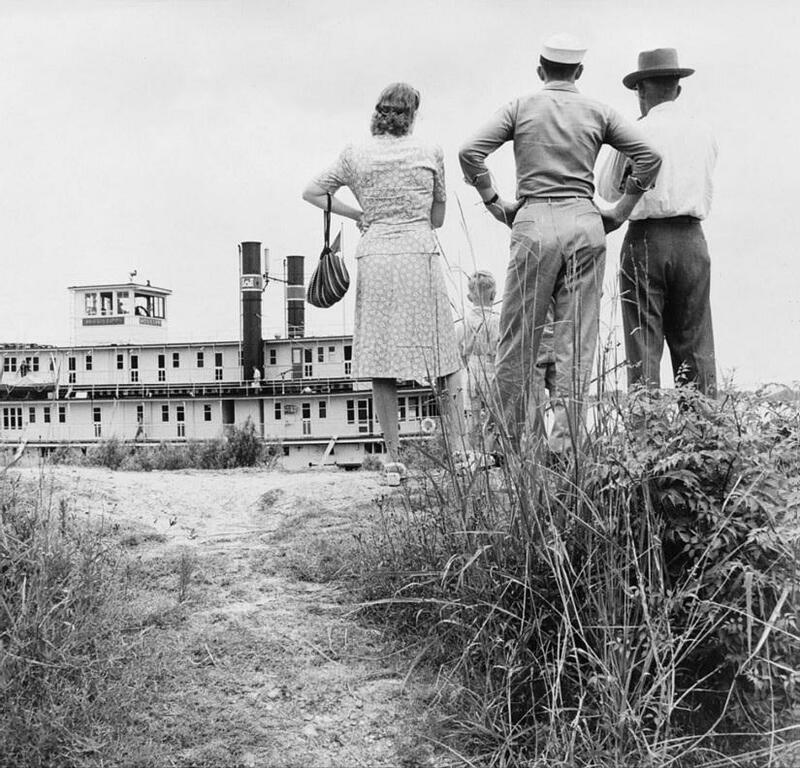 One of many first class pictures taken by married writers and photographers team Edwin and Lois Rosskam's for their great documentary book on towboat life. They covered everyone and every place aboard in pictures and text. Officers, Engineers, Cooks and Housekeepers and deckhands. All in black and white with that sort of Depression era style photography a la Walker Evans and others. Sharp focus and great contrast which is what really brings grayscale pictures to life. There are some prints from the Rosskam's original negatives framed and displayed below the very low 5 1/2 foot ceiling in the texas cabin on the GEO. M. VERITY at Keokuk, Iowa. I always have to hunker down a bit so as not to scrape my head inside that texas. It's like a sauna in there when the humidity is high which is frequently. Most of the framed pictures in the texas as well as the main cabin have suffered from moisture trapped under the glass during the humid seasons. 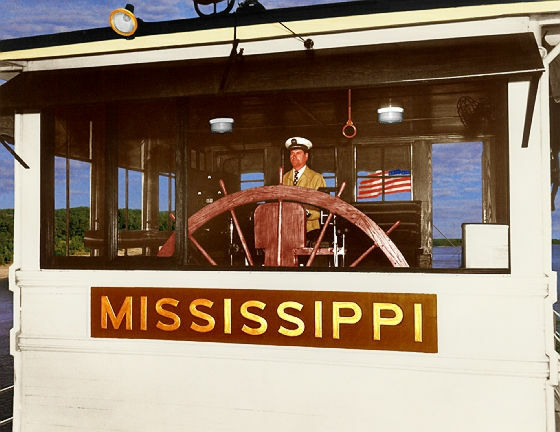 Companion piece to the LIFE magazine photo of the MISSISSIPPI. This photo was likely taken by the same photographer shortly after the other one. 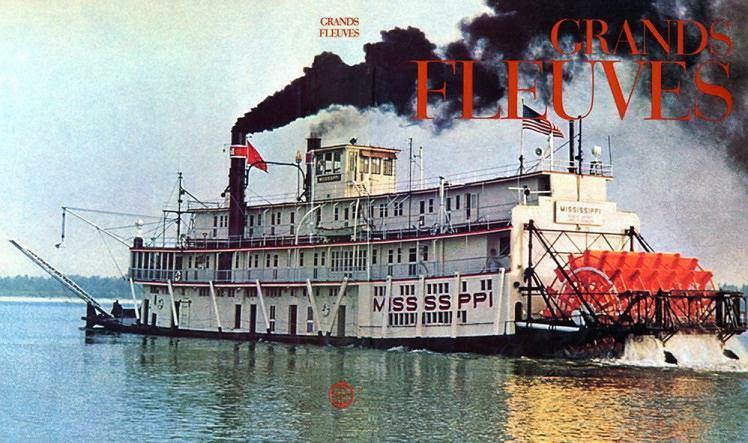 Dust jacket for GRANDS FLEUVES (Great Rivers), by Joseph Jobé, Éditions Mondo, 1968. Attached another fine color photo of the MISSISSIPPI. This is from the Memphis, Tennessee Public Library archives. 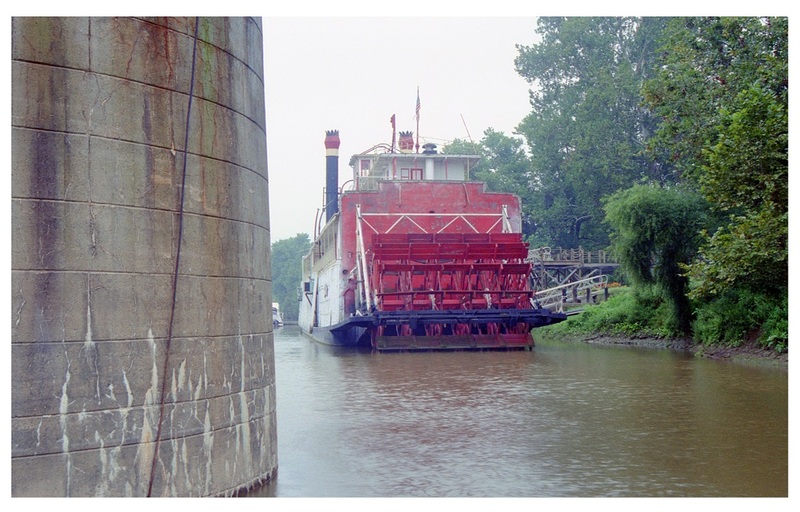 Taken from the excursion boat VALLEY GEM of the "Becky Thatcher" at her berth on the Muskingum River at Marietta by Dave Thomson, Sept 1990. 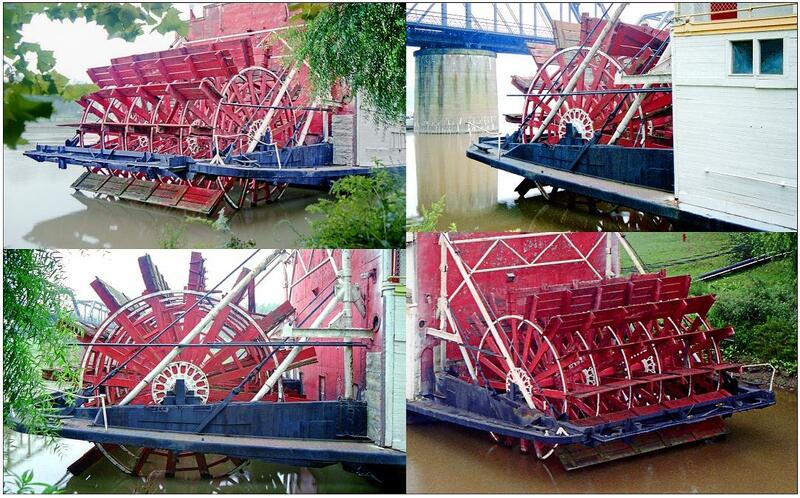 Keith Norrington can be seen on the boiler deck, making a "steamboat wave" to us aboard the VALLEY GEM. In Photoshop I removed the air conditioning duct work from the port side of the boat and changed the boat's name back to MISSISSIPPI. 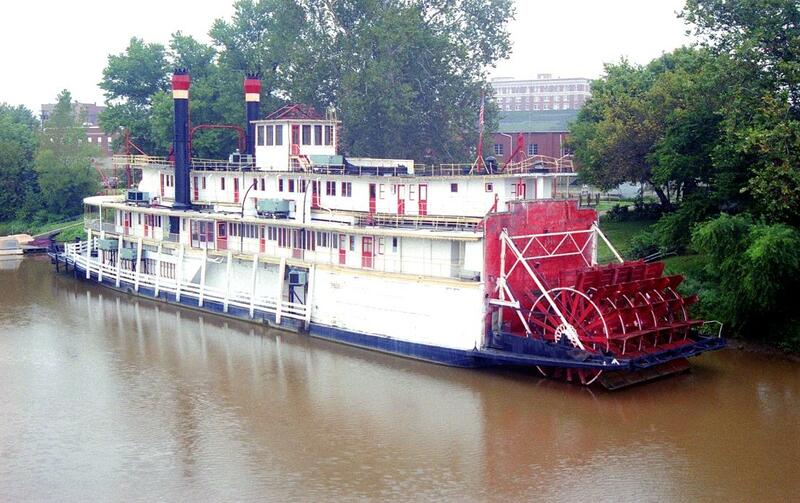 Photo by Bruce Rea of the BECKY THATCHER on the Muskingum River at Marietta, OHIO. Ideal time on a beautiful day, super sharp and clear high resolution image. Perfecta-mundo.